Four swans a’surfing … No, that’s not how “The 12 Days of Christmas” goes, but it’s the perfect way to describe this viral video. 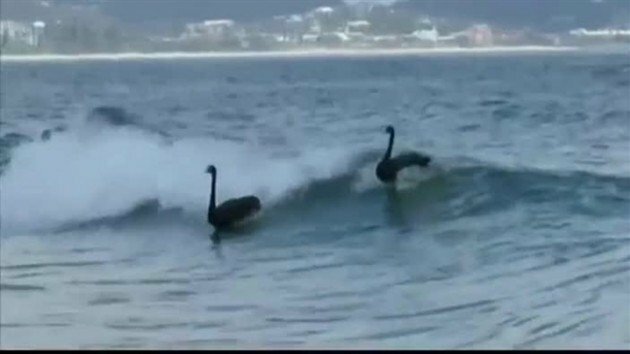 (Image above from Nine News, Channel Nine) I mean, these Black Swans appear to enjoy catching some waves, and it’s just a few days before the holiday. The thing pretty much writes itself! Not sure if Clare will know whether this is a common event Down Under, but either way, it’s fun to watch. In the not-exactly-news category (but for some reason making the rounds again nearly 2 years after it went up on YouTube), but equally cool, is footage of a crow in Russia sledding down a roof. Yes, possessed of the intelligence for which crows are famous, this bird has learned how to turn what is apparently a mayonnaise tub cap into a makeshift sled. May your holidays bring you just as much carefree glee as these birds!